SCREEN Prepares to Exhibit at PRINT 17 | SCREEN Graphic Solutions Co., Ltd.
high-grade finishes as well as greater compatibility with diversified, small lot and personalized printing requirements. In response to these demands, SCREEN GA is currently developing a wide variety of potential new functions for its advanced Truepress Jet520HD high-speed, roll-fed inkjet press. Visitors to PRINT 17 will be able to see provisional features including printheads for extra inks whose installation allows the handling of up to six colors. The heads achieve a wider color gamut and enable a richness of expression that is not possible with conventional four color CMYK process printing. The expanded gamut greatly increases the impact of advertising materials. The press also provides exceptional productivity, delivering a speed of 100 meters per minute on inkjet paper at a resolution of 1,200 x 600 dpi. Major improvements to the drying functions also allow print speeds of up to 75 meters per minute even on offset coated paper, enabling the system to handle a wider range of media including light papers and high-density materials. SCREEN GA will be providing an introductory demonstration of these widely anticipated new features on site during PRINT 17. The use of functional inks is expected to significantly expand the range of applications possible for high-speed inkjet presses. With this in mind, SCREEN GA has equipped its latest Truepress Jet520NX model with printheads for extra inks (provisional feature). The technology has the potential to add considerable value to a wide variety of applications such as transaction printing and work requiring security functions, including check, ticket and direct mail production. 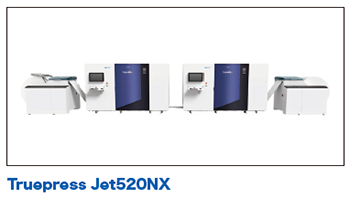 SCREEN GA's EQUIOS solution platform is fully compatible with the cutting-edge functions available with its Truepress Jet520HD, Truepress Jet520NX and Truepress Jet L350UV systems, helping to open up an impressive range of new possibilities for diverse applications. 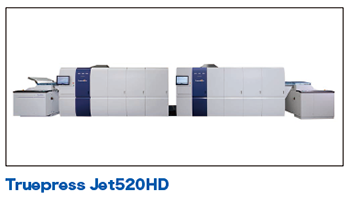 EQUIOS features color management functions that maximize the extended color gamuts provided by the Truepress Jet L350UV and Truepress Jet520HD, which are able to handle up to five and six colors respectively. The platform also supports the imposition and barcode functionality required for book production, enabling better integration with most postpress vendors and improving the automation of small lot book work. 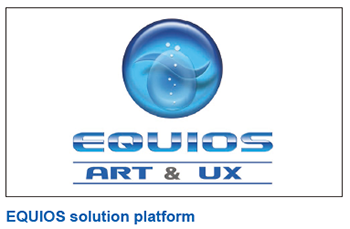 In addition, EQUIOS allows combined data processing for books with different sizes and fold patterns on a single roll. This ability cuts wastage of paper to an absolute minimum, significantly raising production efficiency. Fellow exhibitor Standard Finishing Systems will also use its booth to introduce an advanced perfect binding system that links its own Smart Binding System with EQUIOS. The fully automated solution will be used to stage a practical demonstration with preprinted roll paper. Since its release in 2013, the Truepress Jet L350 has built an impressive reputation worldwide for its ability to print extremely high-quality labels. At PRINT 17, SCREEN GA's latest model, the high-end Truepress Jet L350UV+LM label press for food packages, will make its industry debut. The system features newly developed low migration (low permeability) inks* as well as a nitrogen purge mechanism that accelerates UV curing. These advances open up a wide range of new applications for the press in both the food label and other fields. The system delivers class-leading print speeds of up to 60 meters per minute that further improve productivity, and supports orange as well as conventional C, M, Y, K and white inks. A chilled roller can also be added to the transfer section to enable printing of labels on thin film materials that are sensitive to heat. 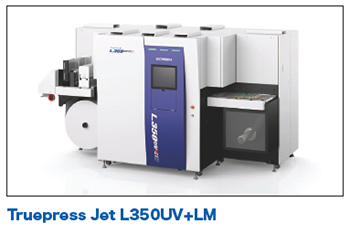 With its exceptional, market tested image processing technologies, improved productivity and media handling, and compatibility with a wider range of applications, the Truepress Jet L350UV+LM sets a new standard for label printing solutions. * Low migration inks cannot be used with, or substituted for, standard inks. Migration levels are subject to individual tests. The results may vary depending on the conditions of usage. SCREEN GA's PlateRite series of thermal plate recorders has secured the number one position in the global market thanks to its unrivaled performance. 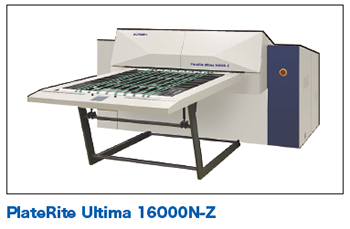 The company has recently expanded this lineup with the release of its PlateRite Ultima 16000N series. These new models provide significant advantages for users with their world class productivity, operability and energy efficiency in A4 size, 16 page CtP. Visitors to the SCREEN GA stand will be able to view videos and other materials that fully explain the systems' outstanding functionality.